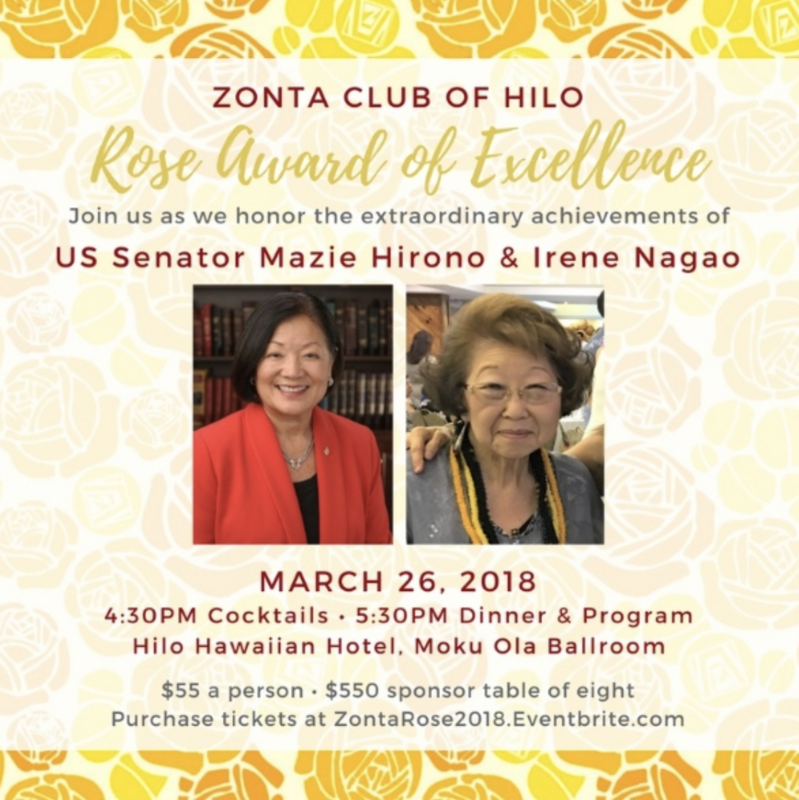 The Zonta Club of Hilo will honor Sen. Mazie Hirono and community leader Irene Nagao with its biennial “Rose Award of Excellence” on Monday, March 26, 2018, at the Hilo Hawaiian Hotel, Moku Ola Ballroom. Doors open at 4:30 p.m., dinner and program starts at 5:30 p.m. The Zonta Rose Award of Excellence recognizes women who have made a significant impact on the lives of others through their employment, volunteer activities and associations. The award is part of Zonta International’s observance of International Women’s Day and Zonta Rose Day. Zonta’s mission is to empower women through service and advocacy. Sen. Hirono has led a life of public service. From working to protect victims of domestic violence to extending protections for Filipino veterans of US military, Sen. Hirono is a fierce advocate for Hawaii, women, children and immigrants in Congress. Nagao, president of Going Home Hawai‘i, has convened public and private groups to support programs for youth as well as those experiencing traumatic loss or integrating back into the community from incarceration. A limited number of tickets, which includes dinner, are available; $55 a person, or $550 for a sponsor table of eight. Purchase tickets at ZontaRose2018.eventbrite.com by Monday, March 12, 2018. For more information email info@zontahilo.org.